........ err, not the body, but the numbers! Of the 40 thieves Alibaba is supposed to nab, he’s reached the halfway mark of 20. Now, due to a change of heart, this has become the body of the elephant and only the tail is left – the 20 that are remaining form a puny mass. But I’m not telling now – you’ll just have to come back to see the tail, and probably the entire elephant! Following are the pattern notations for these 5 motifs. All worked in Lizbeth size 20 with single shuttle. rosette ; picot join to the right ; luggage tag loop or larks head knot ; lock join. Since these are all ‘prototypes’, I sometimes found it difficult to attach the next rosette at a particular point, since there was no picot on the earlier rosette. I countered that by linking current floret somewhere along the line, keeping the overall stitchcount intact. I have given the count for that particular petal/ring in the image. Oh, and all shuttles emptied for a 2nd time as the last motif was being completed. Motifs 16 & 17 can create a nicely niched yin-yang bracelet. The first one was shared here. ‘Tis the season for wreaths! 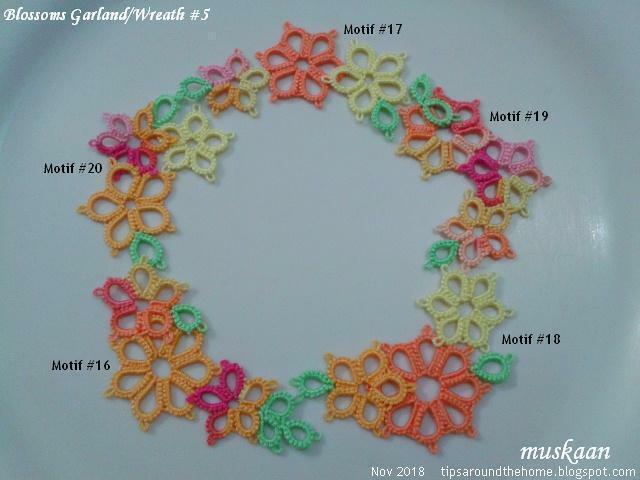 All 5 motifs arranged to form a medium to large wreath or garland. A smaller one, perhaps for a card or as a tree ornament, with only motifs 18 & 19. More garlands/wreaths : Small (#1 & #2) ; Large (#3) ; Medium (#4) . All Blossoms Motifs patterns are being listed under Nature 2D. Yes I agree with Jane, my favorite is 18, 20, and then I saw the bracelet and necklace. I love these colors but here in autumn land I would love to make this in deep red and golden and deep dark pink, I guess you would call it Victorian colors. Oh you got the imagination going! Beautiful! Love the idea of garlands! Thanks, Sue :-) They always make me happy! I love your little motifs. I've saved every one of them. And...I never do that!